Thank you Seth Nagy, County Director of the N.C. Cooperative Extension, Caldwell County Center, for submitting a great article to the Lenoir News-Topic about NC State Extension’s new program to connect landowners and farmers. It worked! I got a call first thing this morning from a cattle and wheat farmer in Caldwell County looking for more land to graze cattle, cut hay, and grow wheat. We look forward to working with Seth and the farmers and landowners in Caldwell County to contribute to the health of the farm economy by assisting farmers in their search for land and by working with landowners to help them find an appropriate farmer to farm and take care of their land. Read the full article on the N.C. Cooperative Extension of Caldwell County webpage and check us out at NC FarmLink. • Find Land to Farm! • Find a Farmer to Farm Your Land! 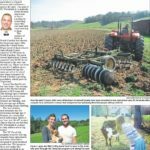 • WNC Farmlink News-Including the First Video!